Swimming pools and spas are perfect places for relaxing, fitness and recreation. Unfortunately, they are also perfect breeding grounds for bacteria, viruses, algae and other primitive organisms. Until recently the only way to "clean" pool water was by adding high doses of chlorine or other chemicals. All these have major disadvantages; they are poisonous, aggressive, unhealthy and uncomfortable to humans and the environment. Now there is an alternative that has none of these side effects, UV-C treatment. You can strongly enhance the treatment of pool and hot tub water and significantly lower levels of chemical sanitizers like chlorine, bromine and biguanides. Imagine swimming in less chemicals, without the irritations, offensive odors and other disadvantages from high dosing of chemical sanitizers. Stop imagining. Install UV Clear® Pool Sanitizer for new construction or for existing pools and raise the bar for water quality with an available technology that is simply, better. Start enjoying the benefits of UV Clear Pool Sanitizer today! How UV-Clear Pool Sanitizers Work? Let's begin with your pool equipment. In order for your pool water to be cleaned it must be circulated. The pool pump is the source for circulating the pool water. The pump draws water from the pool and is directed to the filter. The filter does exactly what it is named for. It traps particles and debris. After the water is filtered it is directed to your UV Clear Pool Sanitizer. The filtered water enters the inlet of the UV Clear System. Water flows through the length of the UV chamber. It is inside the chamber that microorganisms absorb powerful UV light. It is this light energy that destroys or inactivates these 'bugs'. A majority of residential pool owners use some form of chlorine to sanitize the water. They normally maintain anywhere from 1 part per million to 3 part per million [ppm] in chlorine. With the addition of UV Clear® Systems you can now save up to 70% in the cost of chlorine. Wouldn't it be encouraging to know that you can rely on your UV Clear® System when the sanitizer level falls below the norm? Once the water leaves the UV chamber it is returned to your pool. Many pools have a chlorine feeder which can be metered so you can control the level of chlorine. The amount of chlorine in the pool water is called sanitizer residual. We have field studies and reports from customers that are maintaining their chlorine residual at 0.3 part per million [ppm], 0.5 ppm and 1.0 ppm. It's possible that your drinking water could have a chlorine reading higher than.3 ppm. Pool owners that have sensitivity issues toward chlorine can now enjoy the benefits of UV Clear® System by maintaining a lower than normal chlorine residual. If given a choice wouldn't you rather swim in less chemicals anyway? Swim in a clean fresh smelling swimming pool with UV Clear! L" x W" 40" x 5"
• complete installation and users manual, fittings and clamps. "The Ultimate Alternative For Crystal Clear Water"
Ultraviolet light has been established for over sixty years as a reliable means of disinfecting process water. It is widely used within the food and beverage industry, water treatment plants, power industries, textile industries, bottled water, aquaculture biotech, fish farms, and pharmaceutical manufacturing. UV Clear Systems has teamed up with the largest lamp manufacturer in the world, Philips to bring you the latest technology in water disinfection that is better for the environment, safe for your entire family, and will lower your cost in chemicals, energy and maintenance. Why choose Philips to support your system? Philips is renowned for innovation, efficiency and high quality. No other lamp manufacturer in the world can support you with lighting knowledge and skill that philips has built up during more than 100 years. UV-C treatment is not just for water disinfection. Philips has extensive experience in using this technology in equipment for hospitals, bacteriological research laboratories, pharmaceutical institutions, food processing industries, drinking and water treatment, air conditioning, swimming pools and much more. Install UV Clear® on the return line after the water has passed through your filter and before water enters a pool heater and any chemical feeders and/or generator in a vertical position. To control the flow of pool water entering UV Clear® install the unit in a closed loop by-pass. A 3-way valve can regulate how much water goes through the UV chamber. For example, after the water is filtered the valve can split the flow to allow most of the water to flow through the UV chamber and the remainder of the water to be treated by a chlorine feeder or generator. Just run the pump for as long as it takes to turn the water over at least once every day. 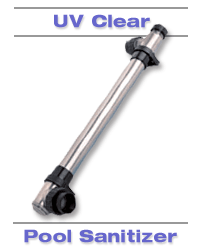 Your UV Clear® System for residential swimming pool applications has 2” union fittings. If your PVC pipe is 1½”, you will need a bushing, which will reduce the opening to accommodate your existing plumbing. For 120 volt models a molded plug is standard. You have the option to plug into an existing GFCI [Ground Fault Circuit Interrupter] receptacle for continuous operation or connect the wiring to the pump’s automatic timer. Consult a qualified electrician that services pool, hot tubs or spas for installing a GFCI and for connecting to an automatic pump timer. 240 Volt models have terminal ends. If you are not familiar with or confused about electrical connections always consult a qualified electrician that services swimming pools. In cases where the pool does not match or exceeds the recommended maximum gallons, multiple units can be installed in series. Any 2 units can be fitted together as long as they are the same voltage. For example, Two 15,000 units can treat up to a 30,000 gallon pool or combine a 15,000 with a 25,000 to treat a 40,000 gallon pool. To connect multiple units in series, use a 2.25 inch length of PVC pipe. Click on Owner's Manual for complete installation directions and safety instructions. Q: What is Ultraviolet Light? A: Ultraviolet light is found in the electromagnetic spectrum between visible light and x-ray. The UV spectrum is arbitrarily subdivided into three bands: UV-A long wave [320-400 nanometers], UV-B medium wave [280-320nm], and UV-C short wave [100-320nm]. Ultraviolet light has been used for over 60 years as a reliable means of disinfecting process water. It is widely used within the beverage and bottled water industry, food industry, water treatment plants, industrial and municipal wastewater, aquaculture, hospitals, fish farms, pharmaceutical manufacturing companies, swimming pools and spas. UV applications are quick, effective and economical. Q: How does UV Clear® work? A: Water is conducted through the chamber of the device where it is exposed to the UV-C band, also known as the germicidal range. At 253.7 nanometers, the light penetrates cell walls of bacteria, viruses and other microorganisms, altering the DNA or the RNA as in the case of viruses. This process inactivates cells so they are no longer able to replicate. A cell that can no longer reproduce is considered dead. Using UV-C is a chemical free disinfection method that can also deplete chloramines. Organic pollutants and chloramines [a disinfectant by product of chlorine], is often the cause of odor detected in pools and spas. Q: Is it safe for bathers and the environment? A: UV Clear® does not emit chemicals into the water and does not impart taste or odor. We are setting an industry standard to help protect you and your loved ones from bacteria, viruses and germs without the skin and eye irritations most commonly found by overdosing your pool with chemicals. With UV Clear®, you can remain in the water while the water is being disinfected. Enjoy swimming in a cleaner, safer and more natural environment with UV Clear®. Q: How is UV-C different from ozone generators? A: The short wave UV-C band from the lamp provides a strong germicidal effect as water flows through the reactor chamber. Our systems do not form ozone. UV Clear® Systems is cost effective, safe, easy to operate, easy to install, uses less components, is efficient and requires little maintenance or monitoring. We have found that UV Clear® Systems works with ozone generators for noticeable clearer water. This advanced oxidation method is implemented for treating water at municipal and industrial levels. Q: Is it easy to use and maintain? A: With UV Clear® Systems, pool and spa owners' demands for simplicity are met. The quartz glass sleeve that shields the lamp from water needs to be cleaned once or twice a year. UV Clear® Systems can offer peace of mind with continuous operation even when sanitizer residual levels fall below normal. A: Chlorine residual is necessary with the use of our system. The addition of UV Clear® Systems to a chlorinated system will allow bathers to achieve a suitable level of sanitizing while using significantly less chlorine and additional chemicals. Q: When do the lamps need to be replaced? A: The useful lamp life is 9,000 hours. If hardwired to the pump's automatic timer and operates for 8 hours daily, then the lamp should be replaced in 3 years. If the pump operates 12 hours daily, then replace the lamp in 2 years. If the lamp operates continuously, then replace the lamp in 1 year. Q: How is the system installed? A: The units are plumbed in-line or installed as a by-pass unit with the pool's filtration system. Install after the filter and before the heater. Head over to the Installation Page for a more detailed explanation. Q: What is the flow rate? A: A common industry benchmark is 90% kill on first pass for E-coli. A typical one HP pool pump can cycle about 4,200 gallons per hour (approx. 66gpm), with a head pressure of 60 ft. of water, or 26 psi. Based on these figures, one 15,000 unit per 15,000 gallons of pool capacity is recommended. Q: Does UV Clear® work with traditional and alternative chemical feeders and generators? A: UV Clear® works with chlorine and bromine generators, salt water generators, mineralizers, ionizers and with ozone generators for advanced oxidation. Chlorination is still widely used but, with the addition of UV Clear® and low chlorine residual this system should be embraced by bathers that prefer to swim or soak in a more natural environment. Q: Why do the openings oppose each other on the housing? A: Water flows in the path of least resistance. The opposed positioning of the inlet and outlet was designed for the mixing of water flowing through the chamber. Q: Will UV degrade chlorine? A: UV from the sun optimally degrades free chlorine in the UV-B [medium wave] wavelength around 290 nanometers. UV-C effectively degrades monochloramine [a disinfectant by product of chlorine]. Remember that UV Clear® works in the UV-C or short wavelength found in the electromagnetic spectrum.